I was so excited to hear about this great new book that reveals how to build financial freedom by creating a side-gig! It’s called The Economy of You: Discover Your Inner Entrepreneur and Recession-Proof Your Life, and it’s just been released today. 1. Waiting until you’re “ready” to launch. Many successful side-giggers discovered their side-gigs almost by accident; a friend asked them for a favor, and suddenly they were in the floral business, or running a social marketing consultancy, or pet-sitting. Instead of first building a Facebook page or stocking up on inventory, they said “yes” to the opportunity in front of them, and their side-gigs grew from there. 3. Thinking you’re earning too little to make a difference. Many side-giggers make what seems like peanuts: $100 to $200 a month, or just a few thousand dollars a year. Over time, however, that money adds up—$3,000 a year equals around $40,000 after ten years if it’s in an account earning 5 percent interest. Plus, it represents new promise and potential in the event of a layoff. “An income of $200 a month, earned from working a few hours a week, can often be scaled up dramatically if time allows,” Palmer points out. 4. Overinvesting in start-up costs. It’s easy to plow savings into a side-gig before it’s even launched: a beautiful website, a professional marketing plan, new certifications. But before investing a cent, successful side-giggers often look for ways to bring in revenue, while simultaneously testing the market. That might mean offering nutrition consulting services before setting up a new website, or selling an e-book through an e-commerce channel before printing paperback versions. In The Economy of You, Kimberly explores the biggest trend in business – microbusiness – starting with her own journey. Recognizing that journalism offers little job security, and with a new baby to provide for, she launched an Etsy shop of money planners to help create a financial cushion. She figured out how to run a small business on the side, finding time to land coverage on blogs and create new products on the weekends. After much trial and error, she eventually found a way to earn an extra $10,000 a year from her Etsy shop and other freelance work. She’s not the only one: The Bureau of Labor Statistics reports that over 7 million workers hold more than one job, and they’re motivated by the desire to earn more money and meet expenses or pay off debt, as well as sheer enjoyment of their second job. 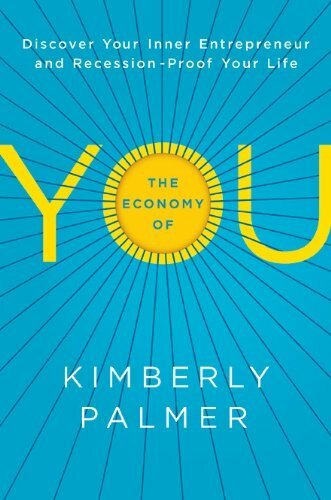 The Economy of You recounts stories of people who, like Kimberly, are liberating themselves from financial strain with a side-gig, guaranteeing their own financial security in the current economy, and finding a sense of fulfillment they never dreamed possible by unlocking their creativity. Kimberly interviewed 100 successful side-giggers, including a deli employee who makes custom cakes at night, a videographer who started a profitable publishing house on the side, and a meeting planner who is a professional opera singer on the weekends and evenings. Companies guarantee nothing but today’s wages. It’s up to YOU to build stability by becoming a money-making engine. It’s empowering, gratifying, and easy to do with The Economy of You. Stay tuned for an exclusive Create Hype interview featuring author, Kimberly Palmer! Thank you Lisa for this helpful overview of “The Economy Of You” book! You highlighted some very important and helpful lessons of starting any business. I think I’m finding that one of the most important skills an entrepreneur can have is cultivating the inside game. By that I mean understanding how to navigate the hazardous waters of our emotions and ego when facing the inevitable setbacks, naysayers and self doubt that comes with taking risks or being creative. Do you know of any good books or other resources for dealing with that? I would highly recommend Daring Greatly by Brene Brown for what the aspects of business that you would like to address. Best of luck!